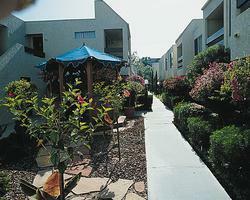 Sand Pebbles is conveniently located to all the attractions of San Diego. Guests will enjoy the resort's outdoor pool, spa, and games rooms. Golf and tennis can be found close by. San Diego is only 21 miles to the south, where you can take in the San Diego Zoo, Sea World, Balboa Park, and the many art galleries and museums the city has to offer. Other area attractions include Disneyland, Knott's Berry Farm, and Tijuana, Mexico.